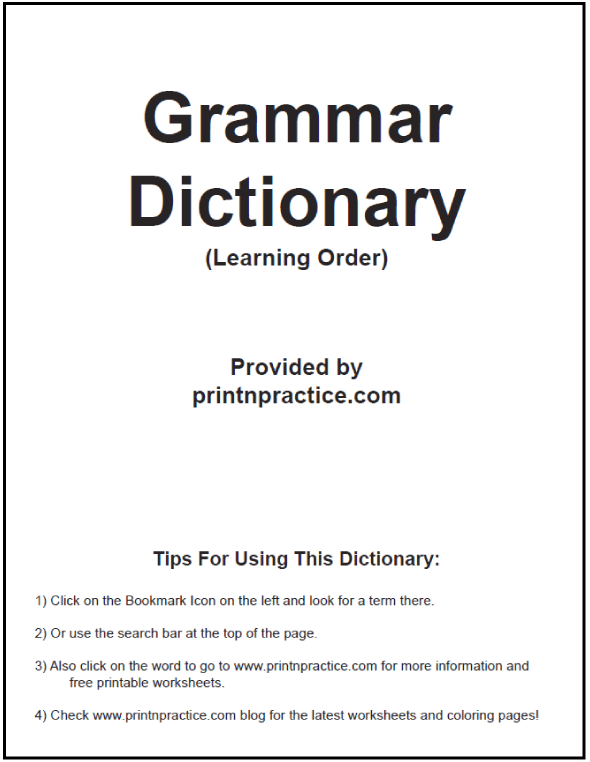 You can use this printable English Grammar Definitions ebook for easy desk reference or online using your phone or tablet: at-a-glance grammar definition resource. "I just want to know the definition!" "Just tell me what it IS." Do you feel this when you're teaching English? Do your students look at you with a blank stare? Do you wish you could hand them a list of the main terms used in English grammar? And it has the same definitions as are in our grammar worksheets. Enjoy! English Grammar Definitions In Learning Order. Print or Digital. Alphabetical English Grammar Definitions Ebook. Print Or Digital. English Grammar terms are easy to learn once you've read a quick reference of the words that define what the words in a sentence do. Read the first definitions booklet which begins with sentence construction and then proceeds with the English parts of speech in learning order. 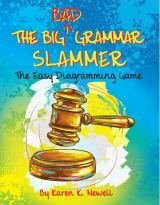 If you quickly read through the definitions in learning order first, and then keep the alphabetical English Grammar Definitions booklet close for reference, you'll be so much handier teaching grammar and it will make sense to your students. Understanding grammar is important for those who write, read, and follow directions. 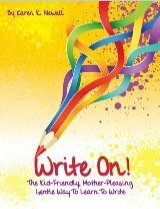 Writers need to convey their thoughts well, so that readers can understand them well. Law makers need to write laws well. Judges and lawyers need to read, understand and execute them well. Engineers need to write well enough that construction workers can build what the engineers designed. Construction workers need to be able to read the designs - in building order. Moms and Dads need to be able to do their jobs; read prayers, letters, directions, and recipes; teach their children; put toys and swing sets together well. We read all day long and we need logical writing. All in all, it's grammar that gives words their logic and order. The day I decided to read the Harvey's English Grammar book, I was surprised not only that such a small book was the main grammar book of old, but also at how much it taught - and so easily. After reading the book I realized that the grammar definition terms were most of what it takes to understand grammar. Since most of the words in English grammar mean what they mean in other venues you really can learn them quickly. Grammar definition of a noun: A noun is a word that names persons and things. Grammar definition of a verb: A verb is a word that tells what the subject does or is. Grammar definition of an object: An object is a word that names what receives the action of a verb (direct objects, indirect objects), or defines the subject (predicate nominatives, predicate adjectives). If you print these booklets double sided, you'll only need eight pieces of paper to cover elementary grammar. That's it! Most of the grammar you'll ever need to know. 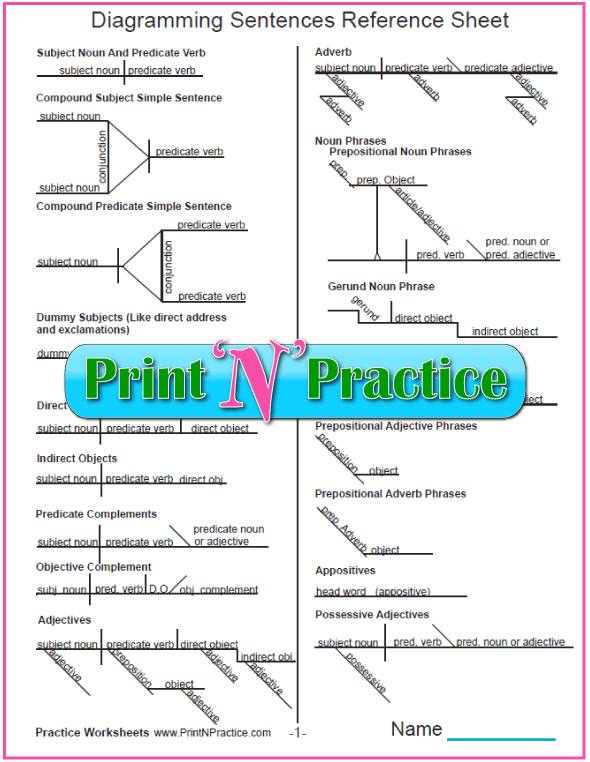 Grammar definitions for diagramming sentences. Sentence diagramming shows you where the parts of speech are used on a graph or chart. How should all the pieces fit together? How can you see the logic in a sentence? Simple. Put the terms on a diagram. Once you see where the different parts of speech fit on a chart, you'll understand the English grammar definitions better. If you would like to see where the parts of speech sit on a diagram, see our diagramming sentences page. 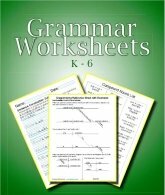 If you would like practice worksheets for grammar beginners, go to our main printable grammar worksheets page. 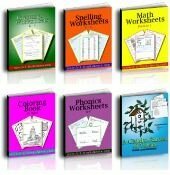 If you'd like to buy all these in one download with many extras, go to our Printable English Grammar Worksheets page.